I found this beautiful post on Guideposts.org. Please take the time to read it. With humility I hope to make this my daily prayer. 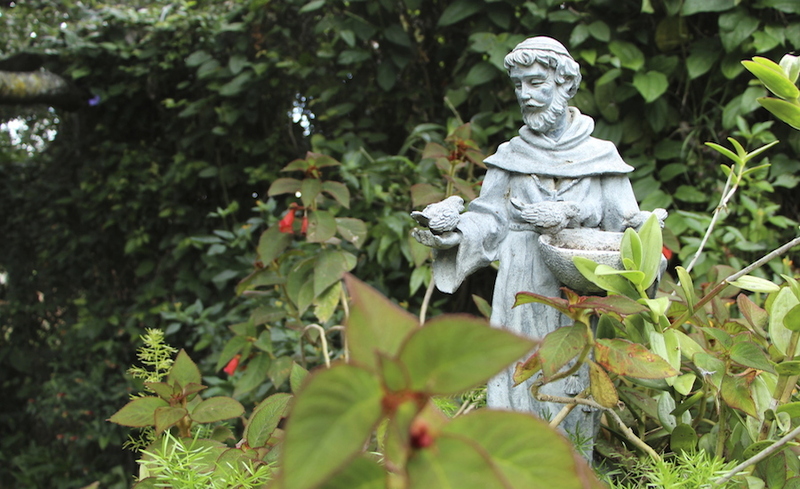 Most often it’s called “A Prayer Attributed to St. Francis” because it has been thought to have come from the dazzling mind and heart of that beautiful soul who lived in Assisi back in the 13th century and charged Christendom with a Jesus-like model for love of all, even the animals. Especially the animals. Where there is hatred, let me sow love. Where there is injury, pardon. Where there is doubt, faith. Where there is despair, hope. Where there is darkness, light. Where there is sadness, joy. It’s funny, though, sometimes a famous prayer can make you feel both inspired and inadequate and after praying these wonderful words, I confess that I started to feel inadequate. How could I do all that? How could I be an instrument of God’s peace. If I was any sort of instrument, most often I felt like an out-of-tune ukulele. The prayer goes on: O Divine Master, grant that I make not so much seek to be consoled, as to console; to be understood as to understand; to be loved as to love. Goodness that started feeling beyond me too. I need love as much as I need to give love and show love and consolation, didn’t I need a huge dose of that? Along with massive bits of understanding? For in giving we receive, says the prayer, and in pardoning we are pardoned, and in dying we are born to eternal life. Yes, giving was important, and I felt better about myself whenever I gave, but all those big challenges of sowing love and faith and hope and light and joy. Ouch. How could I do all that on my own? Then one day at lunch, as I was sitting on a bench outside in the lovely spring sunshine, eating my lunch and saying my prayer, it came to me–it was so obvious, I should have known all along: You don’t have to do this on your own. No, part of prayer is to pray with others. When we say “Our Father” we are immediately including everybody else who is saying that prayer. And this prayer, me as the ukulele, out of tune, maybe missing a string or two…well wasn’t I part of a larger orchestra, a huge rollicking band of faith? That’s the power of prayer. WE do it together. Instruments playing our different parts, doing our different jobs, making our different contributions to peace. Quote | This entry was posted in 1 A Heart for those with Cancer, 1 Guideposts, A Hope for a Cure for Cancer, Amazing Grace, Cancer, Faith, Focus on the Family, Grace, Hope, Inspirational, Johnathan McCravy and Derek McCravy Facebook, Mercy, Music, Peace, Pinterest, Uncategorized, Wounded Warriors Project and tagged 1 A Heart for those with Cancer, 1 Supporters of the McCravy Family as they fight cancer...Thank you!, A field trip to Atlanta with some homeschool friends. To Emma's left is Johnathan McCravy, A Hope for a Cure for Cancer, and the other redhead is Derek McCravy, Derek McCravy, Derek McCravy Raleigh NC, Derek McCravy Writer and Editor, Emma, Greg McCravy, Greg McCravy Raleigh NC, Grief support from Johnathan McCravy and Derek McCravy, http://www.gasaf.net/scholar.html, http://www.ghea.org/media/docs/newsletters/Jan08.pdf, http://www.gwinnettdailypost.com/news/2012/jul/19/art-beat-disneys-the-little-mermaid-jr-swims-into/, http://www.gwinnettmagazine.com/content.cfm?StoryID=1622, http://www.worldmag.com/2009/07/the_best_of_the_last, Jerricho, Johnathan McCravy, Johnathan McCravy and Derek McCravy at http://www.dignitymemorial.com/AnthonyMcCravy, Johnathan McCravy Raleigh NC, Losing, much to her credit Sandra Brooks McCravy applied for every scholarship for Derek that she could get her hands on and it paid off. Some of them, Prayer for Autism, Prayer for those with an eating disorder, Roey, Sam who was adopted by Sandra Brooks McCravy and Greg McCravy of Lawrenceville GA, Sandi McCravy, Sandi McCravy of Raleigh NC, Sandra Brooks McCravy of Raleigh NC, Sandy McCravy of Raleigh NC, To Emma's left is Johnathan McCravy. Bookmark the permalink.